to 24 inches wide, and must be secured on both sides. Fig. 6 shows a valley flashing. If the sheet is 18 inches wide the lateral movement through extreme temperature ranges is about 1/50 of an inch. Where such movement occurs two things may result. A nailed flashing tears at the nails and becomes loose, or the sheet buckles along the edge of the roofing material. As a result of the first, water works under the loose flashing. With the second, failure occurs by splitting or abrasion. This trouble is avoided by securing flashings with cleats. The cleats are nailed, it is true, but Rule II is observed. The large sheet, not being held fast anywhere, moves freely and the cleat takes up the movement. There are other methods of doing away with this trouble, one of which is shown in Fig. 7. Here the sheet has a ½-inch fold under the roof covering. This fold takes up any movement in the sheet. However, it is open to this objection. In applying the roof the fold is liable to become well-flattened, so much so that the metal may receive a surface crack. With subsequent movement — the result of temperature changes — the cracks open and in time the sheet may fail at the fold — just where the water can get under the flashing. If this construction is used care must be observed during laying, to protect the fold against this creasing or flattening. The cleat is shown in Fig. 76. It should be made of 16-ounce (R. T.) copper, not less than 1½ inches wide, and should be fastened with two copper nails. The end of the cleat should be turned back over the nails so as to prevent the nail heads from cutting the sheet. The length of the cleat is determined by the kind of seam with which it is used. It should be about 3 inches for flat seams so as to allow the nails to be placed about 2 inches from the seam. The maximum spacing of cleats should not exceed 12 inches; a spacing of 8 inches is recommended for the best work. This does not apply to concealed valley flashings, etc., where the sheet or strip is held in place by the roof covering. Under these conditions the spacing may be considerably increased. A maximum of 24 inches is recommended. In applying the cleat a copper sheet is placed in position with a half inch bend at right angles to the root Then the cleat-strip is set against it with one inch of the tinned end bent at right angles to the roof on which the other end rests, and with the turned end of the cleat against the turned edge of the sheet which has also been tinned. The next step is to turn the tinned end of the cleat down and over the edge of the sheet and then again turn both down on the surface of the sheet. Then the cleat is nailed to the roof and the last half-inch of the nail end of the cleat is turned back over the nail heads. 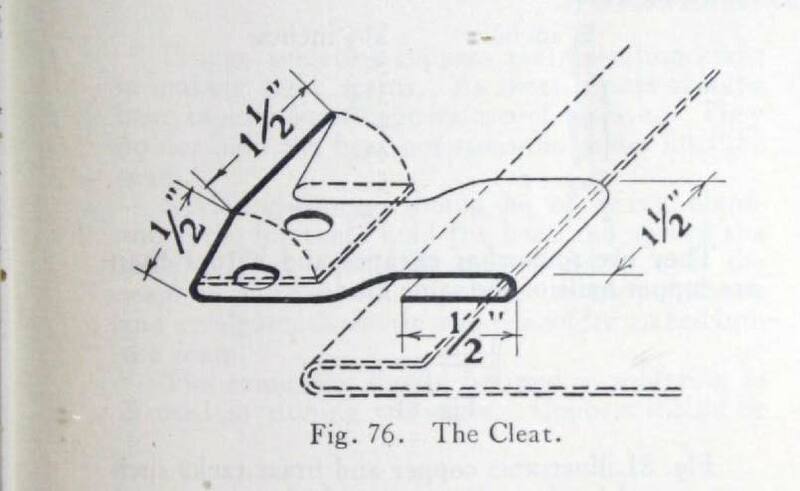 If the cleat also secures a second sheet it is laid as described in Fig. 74, page 49. There are some flashings which, of course, must be nailed. Those around windows and doors, gravel-stops, etc., are secured in this way. Figs. 8, 10 and 37 show these conditions. In every case it will be noticed that Rule I (page 50), has been observed. The flashing strip is only fastened along one line. It is free to move toward and away from the line of nailing. The longitudinal movement is taken care of by placing the nails a short distance apart and by the use of soft (R. T.) copper. The movement during a temperature change of 120° with a nail spacing as great as 12 inches would be only 12/1000, less than 1/64, of an inch; an amount easily taken care of by the soft copper sheet. It would seem that the use of copper nails with copper sheets is so well-established as to be axiomatic. Unfortunately this is not the case. The danger of using iron or steel nails with copper can not be over-emphasized. These differ from the ordinary wire nail in the shape and size of the head. As can be seen from a comparison of Figs. 77 and 78 the ordinary wire nail has a ridge under a small head; this makes it impossible to drive the nail home without injuring the sheet. The large flat-head wire nail is especially made for fastening copper sheets.